The Central Committee of the Chinese Communist Party announced with a heavy heart that Comrade Hu Yaobang, a long-tested loyal communist soldier, a great proletarian revolutionary and politician, an outstanding political worker in our army, who had served in the Party's important leadership positions for a long time and been a marvelous leader, had suffered a large-area acute myocardial infarction while attending a Politburo meeting on April 8, 1989. Despite all medical efforts, he passed away at 7:53AM, April 15, 1989. He was 73. The life of Comrade Hu Yaobang was a glorious one, which is filled with achievements for the Party and the people. He joined the land revolution led by the Chinese Communist Party while he was still a youth and participated in the well-known Long March. From 1939 to 1945, he served as the Minister of Organization in the General Political Department of the Central Military Committee. 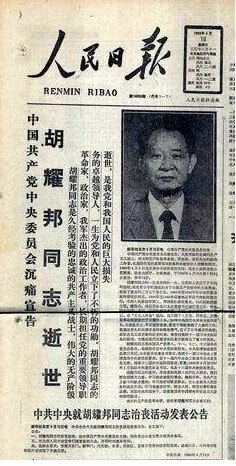 From 1946 to 1949, he served as the acting Political Department Chief of the Jin-Re-Liao Military District and the Political Commissar of 3rd and 4th Columns of the Chinese People's Liberation Army, as well as the Political Chief of the 18th Corp. After the founding of the People's Republic, he served in various positions such as the Party Secretary and Governor of the North Sichuan area, the First Secretary of the Chinese Youth League Central Committee, the First Party Secretary of the Shaanxi Province, and the Second Party Secretary of the Northwestern Region. During the period of "Culture Revolution," he continuously fought against the counter-revolutionary gangs of Lin Biao and Jiang Qing, without regards of his own safety. In 1978, he took the position of the Minister of Organization in the Central Committee of the Chinese Communist Party and did tremendous work in restoring orders from chaos, reversing past incorrect verdicts, and implementing policies for cadres. He displayed extraordinary courage and bravery in being truthful and achieved undisputed results. During the new historical period of Socialist reconstruction, he upheld the policies established by the Party's 11th Congress, 3rd Plenum, and made important contributions in pushing forward the modernization and reform. Comrade Hu Yaobang was a member of 8th, 11th, 12th, and 13th Central Committee of the Chinese Communist Party. He had also served as the Vice President of the Central Party School, the Third Secretary of the Central Disciplinary Committee, General Secretary and Minister of Propaganda of the Central Committee. He was elected into the Central Politburo during the Party's 11th Congress, 3rd Plenum. He was elected to be the Chairman of the Central Committee by the Party's 11th Congress, 6th Plenum. He was the Central Politburo member and its Standing Committee member of the Party's 12th Congress. From September, 1982 to January, 1987, he served as the General Secretary of the Central Committee. He was also a member of the Central Politburo of the Party's 13th Congress. The death of Comrade Hu Yaobang is a tremendous lose for our Party and our people. We must turn our sorrow into strength, learn from his spirit of dedication in being loyal to Party's business, sparing no efforts, and struggling for Communism; learn from his excellent work ethic in closely relating to the masses and serving the people whole-heartedly; and learn from his noble ethics in being modest and curious, yielding to the big picture, and being frugal. Under the leadership of the Party Central, we shall continue to march forward along the path of constructing a Socialism with Chinese characteristics. Be immortal, the great proletarian revolutionary and politician Comrade Hu Yaobang!